Powered by the world's leading data aquisition technology, the Knowlesys Web Newshub System enables web editors to find the latest newsworthy information in a systematic, massive and fast manner every day. 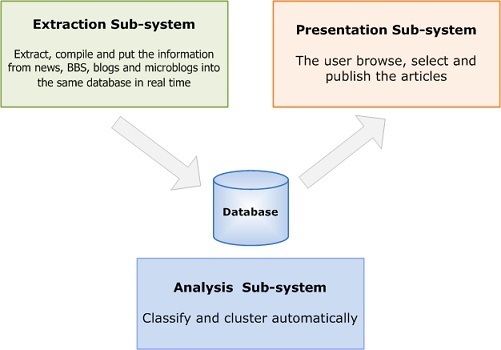 Knowlesys Web Newshub System is an edition platform that automatically collects, summarizes and identifies critical information in real time from numerous target websites (e.g. news, BBS, blogs, microblogs) to find newsworthy information and provide functions for subsequent edition and review. a large number of editors are needed to log in to all sites to manually access, copy and paste the content, which is tiresome. 4. Daily reprint volume is increased by dozens or hundreds of times, and so is website traffic and ranking. The network topology of Knowlesys Web Newshub System is shown below. It can be separately implemented on the Internet LAN and private LAN as needed. The automatic acquisition sub-system can collect any target website automatically. E.g. Xinhua net, bbs.people.com.cn, tianya.cn, xici.net, club.163.com, bbs.sina.com.cn, club.sohu.com, ifeng.com, tieba.baidu.com, and other sites specified by users It can extract all news articles or threads, or content of the latest thread. It can also extract all replies to a threadt or contents of the lastest reply. It can not only monitor a specified target website but also all website around the world without specified target sites, or uses the two modes in combination. It can monitor not only domestic websites but also foreign ones, e.g. BBC, CNN. Knowlesys' web data mining technology is leading in the world and is able to perform accurate collection of any data on any web pages. 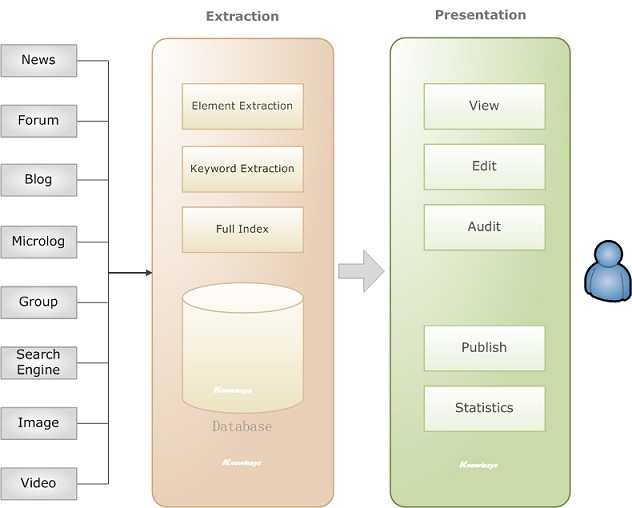 Every day, Knowlesys provides data mining service from all kinds of websites to clients within and outside China. To achieve this, an efficient and stable acquisition platform is necessary. 2. All targets can be monitored. News, BBS, blogs, public chat rooms, search engines, message boards, applications, electronic editions of newspapers and websites can be monitored in real-time. 3. Thousands of news websites can be monitored without additional configuration. With the built-in configuration for worldwide website monitoring, titles and texts can be automatically acquired as long as the key words are typed in. Article texts and titles can be directly extracted from the article-type web pages without additional configuration as well as release dates, while irrelevant contents like adverts, columns and copyright information are removed automatically. For the same URL, each time only the latest uncollected article contents or replies are collected; the contents already aquired are ignored. Automatic deduplication can be applied to reprinted articles. The system can either operate by schedule or on a 7/24 basis, at an interval as short as 1 minute. 10. Users can add target websites themselves. With the acquisition platform provided by the system, users can easily make visual analysis of target websites, configure acquisition task files and add them in the deployment process so as to modify, add and remove any monitored target freely. Different users view different contents, execute different operations and perform different duties. For news and blogs, titles, texts, authors, release time and sources can be collected. For posts on BBS, titles, texts, posting time, view counts, number of replies and poster IP addresses can be collected. and even title lists can be displayed for quick view. The contents acquired can be filtered, classified, added with notes and complied for subsequent management and analysis. can perform precise search or fuzzy search, and can search by category or by source. The manual adding of articles, and the monitoring of news, BBS and blogs are possible. Collection of blocked foreign websites in China, collection of websites subject to restrictions to source IP and access frequency and automatic collection of proxy IP addresses are possible without further configuration. The system is mainly applied to all portal operators. Due to the complexity of the Internet, communication and cooperation with users are required for the implementation of the Knowlesys Web New Reprint System. provide the acquisition configuration files of N websites specified by users. Ensure the contents of target websites can be timely integrated after the system is launched. Copyright ©2018 Knowlesys International Ltd.